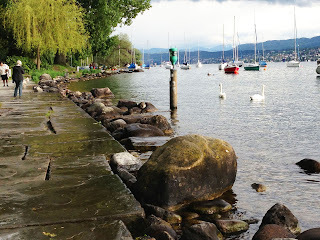 Zurich is a cool place: a bit button-down, with all its banks, but there are some friendly restaurants, and lots of green areas to take a great run. It's one of the few European cities you'll ever find with two old-towns, one on each side of the river, with two very different personalities. Plus, the city straddles the northern tip of Lake Zürich, providing miles of lakeside promenades with constantly changing vistas over the water and past the nearby hills. Old Town: As I mentioned, there are really two old towns, each with its own personality. The eastern side is full of high-priced boutiques along quiet lanes, while the west side has a lot of night life: restaurants and clubs and lots more going on. Enjoy them both! Eastern shore: This shore is lined by parks most of the way and even has a bit of beach. One of the most popular runs in town! Western shore: There are parks and swimming pools along this shore too. Check it out! Uetliberg trail run: This run follows a hilltop ridge at the edge of town. Easy to get to with a train, the views are fantastic!